Since last weekend, I have been working in the boiling sun, chilling in the boiling sun and best of all CLIMBING loads in the boiling sun! 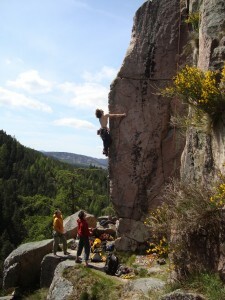 Last Sunday I headed to Pass Of Ballater with a bunch of mates for some sunny granite cragging. It was the start of the awesome weather that we have been having recently, and it was a good day of sendage and psyche. Everyone got a bunch of routes sent, the highlights for me included “Smiths Arête”, “Demon Drink” and “Stoned Immaculate”. It was a brilliant day of people pushing their limits and getting each other psyched, and I spied loads of other lines that I’m keen to head back for in the not too distant future. After a day’s labouring on the farm in the smeltering heat, Adam, James and I headed off up the North West on Monday evening in preparation for another two days of crushing whilst the weather was good. 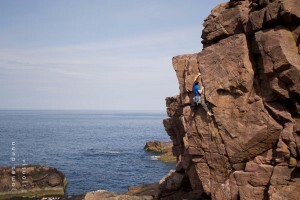 After doing the “Mystic” in the morning and after Adam and James had sent their lines, we headed over to Minch Wall area and got stuck into some routes there. I did the route “Cleopatra’s Asp”, which was unbelievably sweaty and smeggy in the afternoon heat. But after some hanging around to figure out the tricky crux I made my way to the top of the crag with a big smile on my face. James and Adam also did some funky looking routes in this area, and after that we all finished off with some easy bouldering and then chilled out in the sun at the Piglet Wall area. On Wednesday we headed off to Ardmair for another day in the roasting Scottish sunny weather (not a sentence I write very often!). 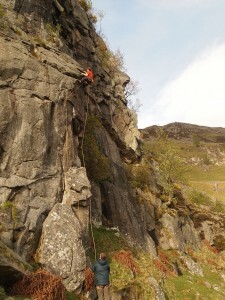 We all managed to get some good climbing done, including one 4 star route and two 3 star routes! It doesn’t get much better than that. After a full day at the crag we drove back south with high spirits and James and I got psyched for our up and coming trip to Fairhead in Ireland which we leave for tomorrow. So watch my blog for updates on what we get done over there. On Saturday morning the usual rainy start had been replaced by blue skies and beaming sun. So I jumped in the car and headed for Dundee to pick up Dougie and Mike Shorter. 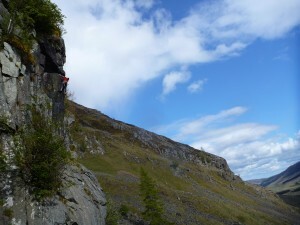 We drove up the glen to the crags around Clova and proceeded to get stuck into an awesome days trading. 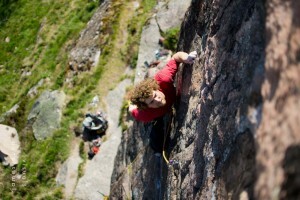 Dougie started the day off by cruising up “Guinness” which was a fun little E1 that definitely packed a bit of a punch. After that Mike did “Alcopops”, another E1 that got sent with very little effort. 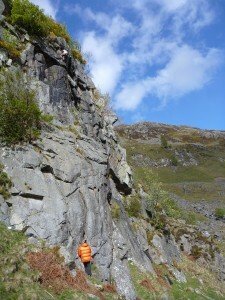 Whilst Mike was leading his route, I ventured off to another part of the crag to familiarise myself and look at some routes that I was keen to get on later in the day. Once Mike and Dougie had abbed back to the base of the crag, I warmed up on the awesome E4 “Stella” which was home to some cool face climbing and good but spaced protection. After that we all moved over to the upper part of the crag (Upper Doonie) and Dougie made short work of another E1 “Vindaloo” which put up a bit of a fight, but he sent it onsight in the end. The route I really wanted to get on takes the blunt overhanging arête directly below the final crack of “Vindaloo”, which is called “D.R.I” and goes at E6. Mike had done the route a couple of years ago and after giving my some awesome Beta, I tied into the sharp end and got on with the job at hand! I climbed up into the crux section and strenuously placed the blind wires that are your last protection for the hard climbing, then proceeded to retreat back down to the platform to psyche myself up for the committing climbing that was to follow. Not knowing if the gear that I had placed would even hold a fall, and even if it did, would it stop me from hitting the spike/ledge below. 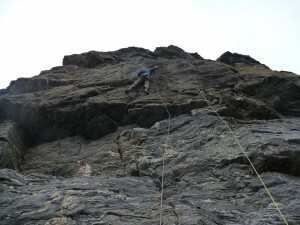 But I took a deep breath and committed past the runners and into the balancey/techy climbing up the face of the arête. Thankfully after struggling to find a good foothold, I eventually managed to pull through and found myself rocking up onto the slab and ending the difficult climbing. 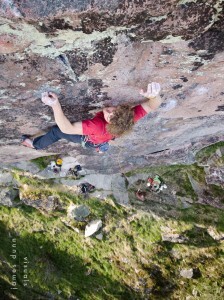 Then it was just up the final crack of “Vindaloo” and the route was sent. Mike went on to second up the route and after we both had abbed back to the bags, we all headed home feeling good with an awesome days cragging in the sun. The next day I teamed up with Neil McGeachy, but much to our disappointment the weather was pretty suspect, with high winds and heavy showers throughout the day. But we headed up the east coast regardless and decided to head to the little sea cliff venue Johns Heugh. After I warmed up on “Jaded Ledge Lizard” E4, it was apparent that the conditions at the crag where definitely a fair bit less than optimal! All the holds up the steep face where really greasy/smeggy and it was not impossible to relax on the holds because of this. But despite the naff conditions we managed to get a couple of routes ticked including Neil making short work of “Arrhythmia” E6, which I would be keen to go back and do on a day with better conditions. 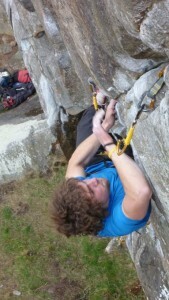 All in all it was a good weekend, and it was fun to get back on the trad routes for the first time this year. Let’s just hope for a drier summer than what we’ve had so far. On Thursday Mike and I headed west towards the good weather, full of psyche, hoping to make some progress on our sport projects at Steall. When we arrived in the Glen the sun was beaming down and the temps were high. With no wind the conditions were not looking good for redpointing but we still headed up to the crag in high spirits. After warming up on Mikes’ crag-board I jumped on Leopold and checked how the warm conditions felt on the slopy crux section of the route. 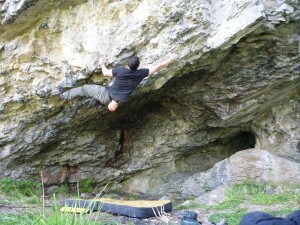 Despite being a bit sweaty, the moves felt ok and I was psyched to get the route sent. After Mike had cranked out some wonder moves through the double roof on his project, I jumped back on Leopold and went for the send. 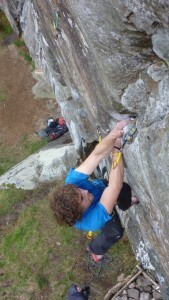 I managed to sick the powerful crux section and then swing right to the better holds that lead to the tricky top section. 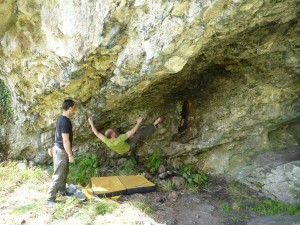 At this point there was a shred of hope that I would send the route on this try. I got some recovery back and then headed for the steep moves up the final section of the crack. But to my disappointment as I pulled through the last finger-lock (which was wet) and reached for the second last hold, my fingers slipped out of the wet crack and I took the fall, blowing my hopes of the send to away. No one likes slipping out of a wet crack! Knowing I had plenty of time the next day to get the route I decided to rest up and when we returned to Fort William I bought some ammunition for my next redpoint attempt, this consisted of some super plus tampons to dry the final moves. The next day after another fingerboard warm up session hanging from a low down bolt, I went for another send attempt on Leopold after Mike had bunged up the top crack with two tampax. This time everything went to plan and I ticked the route on my first shot of the day. Woohoo! 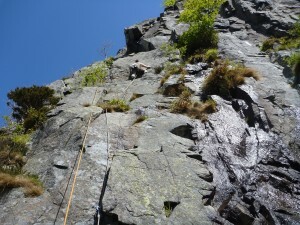 I was super psyched to get the route sent as it is a mega classic of the Glen and my first route at Steall Hut crag. 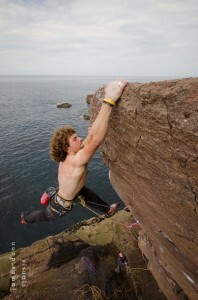 On Saturday, Mike, Dan Timmis and I headed off to check out a potential new bouldering venue on the West coast. 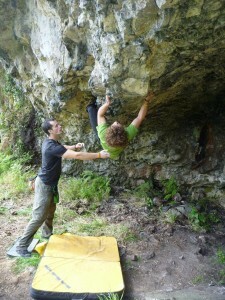 It was good fun to try some new stuff and Mike and Dan managed to send some new problems at the crag, two new 7a+’s. After losing most of my skin on Saturday, Mike and I returned to Steall for a quick route working session, which didn’t last very long. But it was fun to make the most of the good weather before heading back to a rainy Fife. Me on "Bone Crusher 300"